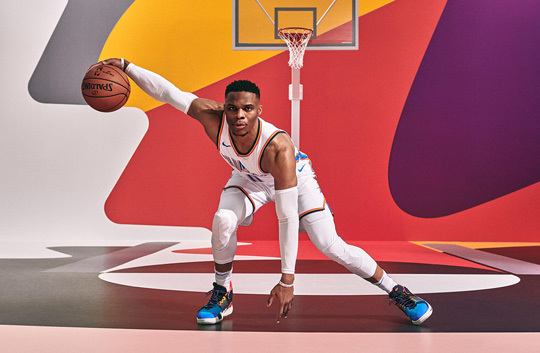 Westbrook’s second signature performance sneaker, the Why Not Zer0.2, is a reflection of him owning the chaos: The design may seem chaotic, but Westbrook planned every element of it with a specific purpose in mind. Here are five things to know about the shoe. The lead colorway of the Why Not Zer0.2, dubbed “Future History,” features vibrant color-blocking on different performance materials. At first glance the design may seem random, but each color is meant to reference a uniform that has helped define Westbrook’s career. The only thing Westbrook loves more than the game is his family, which is why he added his family crest on the inner tongue. He also used a black block on the midsole to honor late best friend, Khelcey Barrs III. “It’s become a tradition for me to honor Khelcey by writing ‘KBIII’ on my game shoes. Each colorway of the Why Not Zer0.2 will have a designated area for me to write that on. I want people who wear my shoe to understand that playing with a purpose bigger than yourself is important,” he says. When it came to this design, Westbrook said he wanted a shoe that was created specifically to harness his game rather than follow any current style trends. Since entering the league, Westbrook has remained committed to inspiring the youth through his charitable work, and his message to them has always been: “Why not me? Why not follow your dreams?” Hence he pushed the Jordan Brand design team to create a premium performance shoe with an accessible price. “Being a father, it was important to have my signature shoe available in full family sizing. You don’t see that often with performance shoes, but for me it’s all about inspiring the next generation. That also means making the shoe affordable and accessible to people all around the world,” says Westbrook. The Why Not Zer0.2 was released in men’s sizes globally on Jan. 10 and in all sizes later this month. 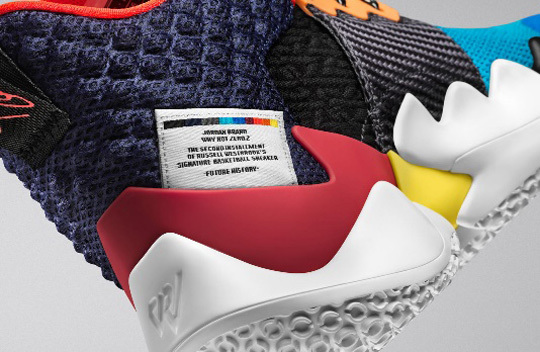 An exposed tag explains the meaning behind the colors used in the Why Not Zer0.2. Learn more about the inspiration behind the “Future History” colorway at air.jordan.com.